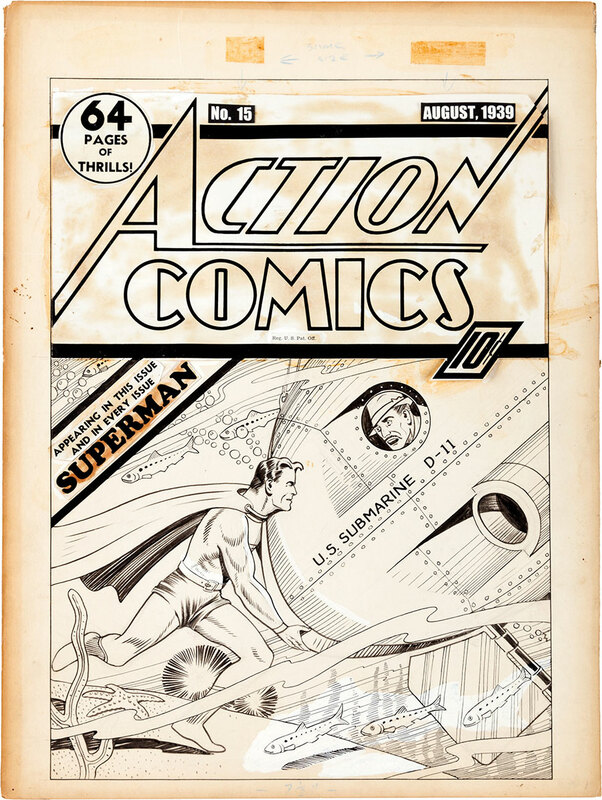 The earliest Superman cover art known to exist – Fred Guardineer’s thrilling visage of the Man of Steel from Action Comics #15 – may bring $200,000+ in Heritage Auctions’ Feb. 20-22 Vintage Comics Signature® Auction in New York. The rare work joins nearly 1,200 lots, including two Silver Age milestones: Amazing Fantasy #15 – the first appearance of Spider-Man – in 9.0 grade by CGC, and the original cover art to Tales of Suspense #84 by Jack Kirby and Frank Giacoia. Fans who enjoyed the first offering of the Don/Maggie Thompson Pedigree Collection still have a range of high-grade books to choose from with a 9.4 grade CGC NM copy of Tales of Suspense #39, the first appearance of Iron Man. Surprise discoveries include the finest known copy of Amazing Man Comics #5 (#1), 9.4 CGC Mile High Pedigree, a rare and sought after issue that the Overstreet Price Guide classifies as one of the Top 100 Golden Age books. Fewer than 10 copies of the book exist and this is one of just two copies known in the best condition ever recorded. The selection of art includes Robert Crumb’s original drawings for a complete three-page story “Ducks Yas Yas” from Zap Comix #0. Art from early underground comics is seldom offered at auction and this rare set shows Crumb’s unmistakable style behind a Rapidograph mechanical pen. Another important work, the original cover art by John Buscema and George Roussos for The Avengers #42, is just the second Avengers cover Buscema ever drew. The auction also features the Dino Mauricio Golden Age Classic Cover Collection: 150 of the most collectible covers representing important themes, iconic characters and rare images, such as Superman #1 and Detective Comics #31 to rarities like Great Comics #3 with its “Hitler in Hell” cover. Gene Colan and Joe Sinnott’s original cover art for Captain America #117, the first appearance of Falcon. A fist-filled splash page by Jack Kirby and Vince Colletta pitting Thor against Hercules, as seen on page 9 in Thor #126. Rare original art from page 6 of Frank Miller’s Batman: The Dark Knight Returns #2, drawn by Miller and Klaus Janson. The original cover art for The Invincible Iron Man #65, drawn by John Romita, Sr., and Mike Esposito. Heritage Auctions is the largest auction house founded in the United States and the world’s third largest, with annual sales of more than $800 million, and 850,000+ online bidder members. For more information about Heritage Auctions, and to join and receive access to a complete record of prices realized, with full-color, enlargeable photos of each lot, please visit HA.com.